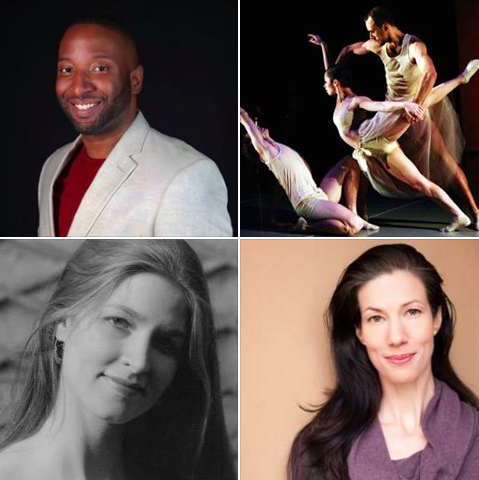 Thank you to our amazing Spring Open Class series guests: Maria Bauman, Lindsey Dietz Marchant, Pamela Pietro, Becky Radway, Stuart Singer, Nathan Trice and Manuel Vignoulle. Open classes were held in July W/ NEW WORLD SCHOOL OF THE ARTS Alumni Guests including Christopher Rudd, Artistic Drector of RudDUr Dance, and Britt Juleen, formerly of Dutch National Ballet and currently Artistic Director of The Berkeley Ballet Theater . An incredible season w/ Megan Williams, Leonides Arpon and Marcia Brooks, culminating in our most robust performance yet, on June 15th in Greenwich Academy's Black Box theater. Performed by Rebecca Ayars, Lourdes Blansfield, Courtney Brodie, Marcia Brooks, Diane Effros, Theresa Hall, Lindsay Potter, Nancy Schwartz, Debbie Vingo and Allison Waggener. An outstanding roster of guest artists for our first Master Class Series! Wed. October 28, 7:30 PM - Free Informal Performance - Fall 2015 Mixt Co.
Brief performance begins at 7:30 PM, followed by a casual reception and discussion of the work presented. Join us for our FREE informal performance of the MiXt Co. Spring Performance Project, on June 10 at 7:30 PM in Greenwich Academy's Black Box Theater. Works by Becky Radway, Nathan Trice and Emma Cotter's RETTOCAMME. Performance begins at 7:30 PM, followed by a casual reception and discussion of the work presented. Winter 2015 informal showing of work created during the Winter 2015 Class + Performance Project, featuring work by Pamela Pietro and Dante Brown|Warehouse Dance, performed by Courtney Brodie, Marcia Brooks, Diane Effros, Theresa Hall, Annie Heinemann, Theres Kull and Nancy Schwartz. With Gwen Welliver and John J Zullo ended with an informal performance of work created during the MiXt Co. Class + Performance Project featuring work by Gwen Welliver and John J Zullo, performed by Courtney Brodie, Marcia Brooks, Diane Effros, Theresa Hall, Annie Heinemann, Rebecca Moore, Megan Ormond, Abby Redmond and Nancy Schwartz. This FREE performance was held in Greenwich Academy's Black Box Theater, at 7:30 PM on October 22, 2014 followed by a casual reception and discussion of the work. Informal Performance of work created during the premiere season of the MiXt Co. Class + Performance Project featuring works-in-progress by Tara Lee Burns, Peter Kyle and Rebecca Moore, performed by Courtney Brodie, Marcia Brooks, Theresa Hall, Nina Hanlon, Annie Heinemann, Seth Potter and the choreographers. The FREE performance was held in Greenwich Academy's Black Box Theater with a casual reception and discussion of the work. Marcia performed "Extra, Extra Stuff," a new version of the original piece "Extra Stuff" with new music mixed live by P.U.D.G.E, as part of the Sans Limites live music and dance festival. a short evening of company repertory as well as the 20-year anniversary performance of “Extra Stuff,” a solo Marcia created and performed at New World School of the Arts. Special guests joined the company for a performed improv. MBVW collaborated in a "Round Robin." Marcia Brooks, Kimberly Lantz and Meghan Schardt each choreographed duets for the other two dancers, with a common thread. Performed at Greenwich Academy. MBVW's premiere performance - An Afternoon of Dance with Marcia Brooks/Various Works. Held at Massey Theater, Greenwich Academy.